Among our clients are the biggest organizations in our market. We have been involved in the development of critical projects for them in the past 15 years. Included in our customer list are telco companies, financial institutions, commercial companies and more. The past 4 yours we are very proud to provide our services to the biggest airline in the country. We have been developing software for them in order to cover critical business needs. In the next period, we will post information for these solutions and we are available any time to share more info. Our first solution that we plan to present to other major airline companies globally, is a system that fully manages CodeShares for a Commercial Airline. What is Code Share Management?? From wikipedia…” A codeshare agreement, sometimes simply codeshare, is an aviation business arrangement where two or more airlines share the same flight. Sharing, in this sense, means that each airline publishes and markets the flight under its own airline designator and flight number as part of its published timetable or schedule.” – link . 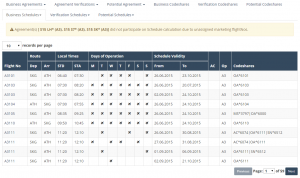 Syndesis uses the airline’s commercial agreements, flight schedules, MCTs (minimum connection flights) etc. and builds a customizable rule engine. The Routes Calculator then returns the best available code share connections based on a number of criteria (user-configurable). The solution builds a code shared network for an airline as the operating or the marketing partner of the agreement. Automatic flight number assignment and error checks are part of the standard functionality, which improves the quality of the schedule. Syndesis uses IATA standard SSIM (Standard Schedule Information Manual) functionality for all import/export processes. It also provides schedule generation capabilities and schedule comparison functions. The solution is a web based system, developed with Miscrosoft .Net, SQLServer as the database back end and Bootstap framework that creates a modern UI experience.